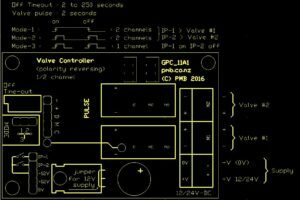 A controller for 12V or 24V valves requiring polarity switched pulse control. These valves are useful in many applications including garden and lawn watering and hydroponic systems. They are useful in solar powered applications due to their power use only while switching off to on or on to off. 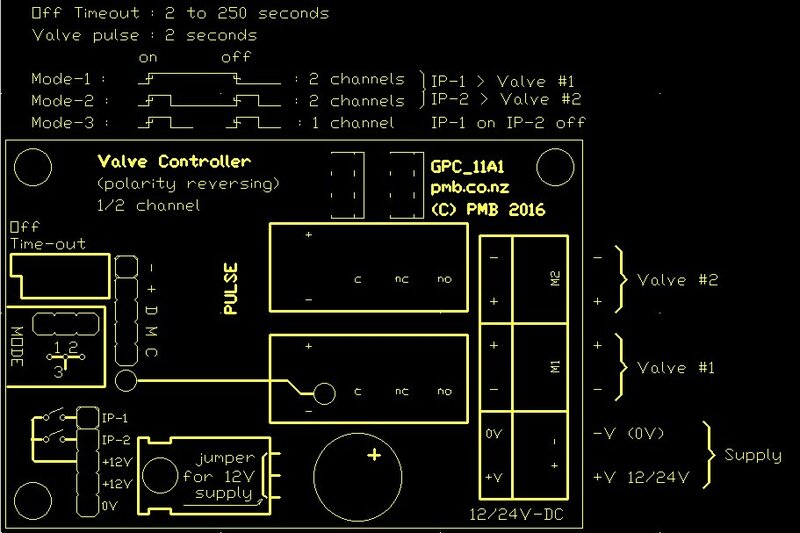 This controller receives control signals, steady or pulsed, and provides +ve and -ve polarity power pulses to the valve. The jumper can be positioned to the left, right or not installed (center pin only). The valve opens when the input goes active (high or +ve) and closes when the input goes inactive (low or off). The valve effectively follows the input control signal. Both channels can be used. The valve opens with the first pulse and closes with the second pulse. The disadvantage is that the valve can go out of sync with the intended controlling signal. This mode can be used with the failsafe timeout providing the valve closing. Both channels can be used. The valve opens with a pulse on input-1 and closes with a pulse on input-2. Only one channel can be used. When the valve turns on a timer starts. The valve can be manually turned off, or the timer will expire and turn the valve off. 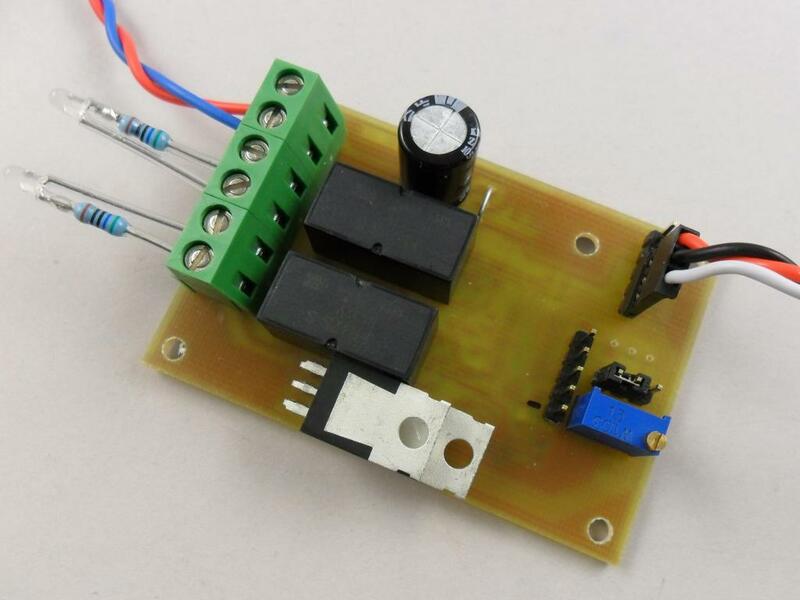 The delay is adjustable up to about 4 hours (2 and 250 minutes) using the potentiometer. The default setting is 1 hour. Other defaults available on request. Adjusting anti-clockwise reduces the timeout, clockwise increases the timeout. The timeout can be used with Mode-2 to provide the off part of the control. This allows a single pulse to turn the water on, to run for a timed period. The main supply voltage is monitored. If the voltage drops below 12V (default setting), the valve/s switch off. If the supply voltage is below 12V the valve/s will not switch on. This feature is intended to suit solar powered remote watering systems – to ensure that water flow shuts off when the battery capacity is low. This diagram indicates connections and mode functions. Power is applied to the module and one or two valves connected. The control inputs can be from switch or relay contacts or a low voltage control signal. This could connect to a receiver or other watering controller.